I get this box for my youngest daughter and she is always so thrilled when she gets it in the mail! Stuffed animals, pens, stickers, headbands... she has received so many things that she just absolutely loves! Was anxious to receive this box and loved it! Felt like a little kid again.. I was very happy with the Unicorn Dream Box and look forward to my next shipment. It's amazing. Comes with all sorts of nifty items.! She absolutely loves it and receiving it in mail! 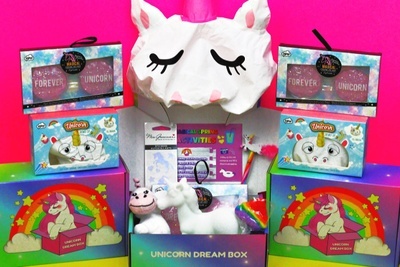 I got the Unicorn Dream Box for my granddaughter and she loved it. She pulled out each item at a time and was pleased with every gift. I can not wait for her to get her next one and realize that she will get something every month.